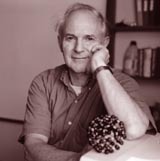 Kroto studied chemistry at Sheffield University where his PhD studies on the spectroscopy of free radicals produced by flash photolysis were undertaken with Richard Dixon. In 1964 he took up a postdoctoral position with Don Ramsay at the National Research Council in Ottawa, where Gerhard Herzberg had created the mecca of spectroscopy with his colleagues Alec Douglas, Cec Costain, Don Ramsay, Boris Stoicheff and others. In 1965, after a further year of flash photolysis/spectroscopy in Don Ramsay's laboratory, where he discovered a singlet-singlet electronic transition of the NCN radical and worked on pyridine, which turned out to have a non-planar excited state, Kroto transferred to Cec Costain's laboratory because he had developed a fascination for microwave spectroscopy. There he worked on the rotational spectrum of NCN3. In 1966, after two years at NRC, John Murrell (who had taught Kroto quantum chemistry at Sheffield) offered him a postdoctoral position at Sussex but he was quite keen to live in the US and managed to get a post-doctoral position at Bell Labs (Murray Hill) with Yoh Han Pao (later Professor at Case Western) to carry out studies of liquid phase interactions by laser Raman spectroscopy. During the year he received another letter from John Murrell to say that the position that had been available at Sussex the previous year was still available but would not be so for much longer. Thus Kroto came back to the UK. He was just about to start writing off for some positions back in the US and had just located the address of Buckminster Fuller's research group (he was interested in the way that predesigned urban sub-structures might be welded into an efficient large urban complex) when John Murrell offered him a permanent lectureship at Sussex which he accepted. Kroto started to build up a microwave laboratory to probe unstable molecules and Michael Lappert encouraged him to use his photoelectron spectrometer to carry out work independently. By 1970 he had carried out research in the electronic spectroscopy of gas phase free radicals and rotational microwave spectrocopy, built He-Ne and argon ion lasers to study intermolecular interactions in liquids, carried out theoretical calculations and learned to write programs. At Sussex he carried on liquid phase Raman studies, rebuilt a flash photolysis machine and built a microwave spectrometer and started to do photoelectron spectroscopy. He eventually got funding for a microwave spectrometer at Sussex. The first molecule studied was the carbon chain species HC5N - to which the start of Kroto's role in the discovery of C60 in 1985 can be traced directly. In 1990 when the material was finally extracted by Krätschmer, Lamb, Fostiropoulos and Huffman, Kroto and his colleagues Roger Taylor and David Walton, decided to exploit the synthetic chemistry and materials science implications.